It was another excellent week for Chichester City and Pagham in the SCFL premier division. City picked up four points out of six, Pagham six. Here are the details from the sides’ ongoing bid to win promotion to next season’s rejigged Bostik League. 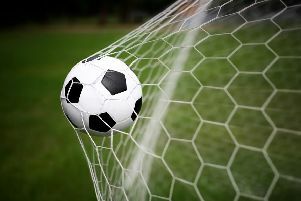 A fiery but goalless encounter between Chichester City and Eastbourne Town – two sides level on points near the top of the SCFL premier division – was played out in difficult conditions as the Beast from the East returned. Referee Jonathan Wilks brandished a number of yellow cards and Chichester’s Kieran Hartley was shown a straight red with 15 minutes to go. In the fourth minute the visitors had a penalty shout dismissed after a strong tackle by Scott Jones on the edge of the box. At the other end Kaleem Haitham’s shot from the edge of the box was wide. Eastbourne’s Aaron Capon chose to cross when he perhaps should have shot before Ruben French sent in a free-kick that was just too high for Jimmy Wild. Wild broke down City’s left flank but was unable to pick out Jones or Haitham in the centre. Left-back French put in a teasing ball which Dan Hegarty met, but the midfielder’s header skimmed narrowly wide. In the 20th minute Capon crossed for Evan Archibald, who struck the crossbar with a curling effort. Wild set up Jones, but he could only direct his shot at Greg Nessling – before Dave Herbert was denied by the visiting keeper. In the 40th minute it was City’s turn to hit the woodwork as French put in a quality delivery which Hegarty powered on to the bar only to watch it agonisingly bounce down but not over the line. Hegarty had the first effort of the second half but his goalbound shot was blocked by Town’s defensive wall after more encouraging play by Jones and Wild. French went on a strong run in the 54th minute and Chi keeper Ant Ender had to save from Capon as Town pressed. The visitors had another penalty appeal turned down and City captain Jack Lee had to make two crucial tackles. Jones dragged an effort wide just after the hour. Moments later Eastbourne centre-half Sam Willett was fortunate not to pick up a second yellow card for a strong challenge. The referee did get a red card out in the 74th minute. Hartley went in strongly on Simon Johnson, and after consulting with his linesman, the referee gave the defender his marching orders, to the dismay of the home fans. It spurred on City and the ten men pushed for a winner. Substitute Scott Murfin should have done better five minutes later but shot straight at Nessling. City sub Ryan Peake saw his header gobbled up by the Eastbourne keeper. A hat-trick of chances saw the visitors denied by a mixture of fine blocks by Peake, the woodwork and super work from Ender. With two minutes to go Wild was put through by French but Nessling pulled off an incredible save, parrying the ball on to the post. From the resulting corner Hegarty looked to have won it, only for Nessling to save again. City won 2-0 at Horsham YMCA on Tuesday night. Kaleem Haitham and Lorenzo Dolcetti were on target in the second half. Things remain tight at the top of the league with only three points separating second from seventh. Chi travel to AFC Uckfield Town on Saturday. * A first-half goal blitz set Pagham for a big away win that enhanced their chances of a top-two SCFL premier-division finish and promotion. After making the long trip to Eastbourne, the Lions were up for it from the word go and by the interval were 4-1 up. Callum Overton, Ryan Cox (2) and Lloyd Rowlatt (43) were the scorers, while United did manage one in reply through Callum Hart. Pagham never looked in much danger of conceding control in the second half although had to wait until three minutes before the end for a fifth goal, scored by Scott Rafferty. Pagham’s fine week on the road continued on Tuesday night when they won 3-1 at Crawley Down Gatwick. It left them fourth in the table just six points behind leaders Horsham YMCA. Dan Simmonds gave them the lead with a goal just before half-time but it was cancelled out by Ben Wilson early in the second half. But Callum Overton and Lloyd Rowlatt both struck in the final quarter of the game to seal the points. Richie Hellen and Tom Simmonds’ side host Newhaven on Saturday and East Preston on Tuesday.